This study aimed to test the much-pronounced but poorly supported theory that “Guinness does not travel well.” A total of 4 researchers from 4 different countries of origin traveled around the world for 12 mo to collect data on the enjoyment of Guinness and related factors. The main outcome was measured on a Visual Analogue Scale (VAS) from 0 (enjoyed it not at all) to 100 (enjoyed it very much). A total of 103 tastings were recorded (42 in Ireland, 61 elsewhere) in 71 different pubs spread over 33 cities and 14 countries. The enjoyment of Guinness consumed in Ireland was rated higher (74 mm VAS) than outside Ireland (57 mm; P < 0.001). This difference remained statistically significant after adjusting for researcher, pub ambience, Guinness appearance, and the sensory measures mouthfeel, flavor, and aftertaste. This study is the first to provide scientific evidence that Guinness does not travel well and that the enjoyment of Guinness (for our group of nonexpert tasters) was higher when in Ireland. Results, however, are subject to further verification because of limitations in the study design. Does this study distinguish the origin of the product? 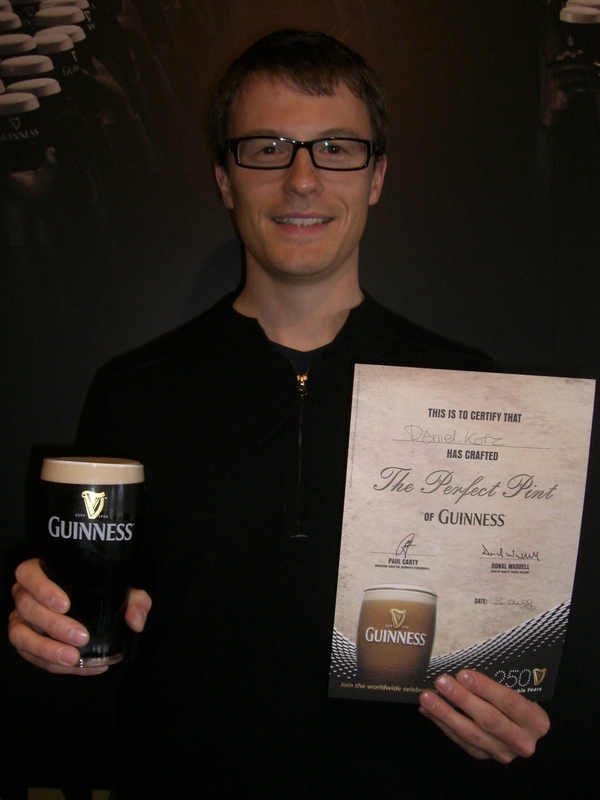 Guinness is brewed in multiple locations (St. James’ Gate, Dublin; Park Royal, London, &c.). Does the study flag the different origins of the product tested at different locations? Happy St. Patrick’s Day! Thom. Thanks for this very good question. We were not able to take into account the different origins of Guinness we tasted at the various locations. Guinness is nowadays brewed in about 50 countries, using locally sourced ingredients like water. Therefore, one could argue that any Guinness brewed outside Dublin is materially different. Therefore, the question “Does Guinness travel well?” should be interpreted metaphorically for something like “Does Guinness taste different in Ireland than elsewhere?”. Congratulations on getting it published, Finding that article in the journal, made my day. 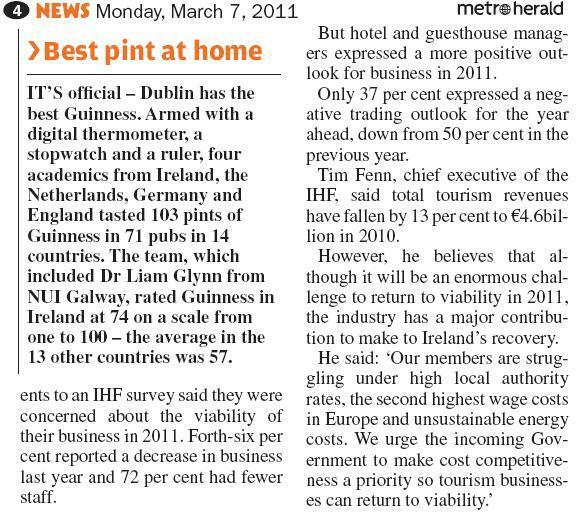 Any response form guiness/diageo? Will there be any follow-ups? Thanks, and I’m glad to hear you like our paper! We have not had a response from Guinness yet. I would be curious to know what they think about our investigation, though.